You know when you crave something and then you don’t make it and then, for weeks or months, you have this little nagging desire at the back of your brain? I’ve been wanting to make enchiladas for the longest time, but during my food funk I never got around to making them, and two or three months later I finally decided to give them a go–that’s what friends and weekly potlucks are for: motivation. But, with my enchiladas, I didn’t want to make the usual vegan version–the ubiquitous V*Con sweet potato and kale ones. I love the V*Con enchiladas as much as I love both sweet potatoes and kale, but I’m a bit sweet potatoed out these days. So when I saw Homesick Texan’s cheese enchiladas with a chili gravy, I knew I had to make them. But what filling to use? Then it hit me–if I’m going to the amazing Mexican grocery store on the outskirts of town to buy chiles to make my own chili powder, then I might as well pick up something like sweet potatoes but not–i.e. plantains. I’d heard about plantain mash, but never made it, so I thought it might make a good base for the filling, and with black beans and corn mixed in, the entire combo sounded like a winner. Important note regarding the homemade chili powder which I think is integral to this recipe: blister the dried chiles in your oven, not in a cast iron skillet. I love my cast iron, but the first recipe I made burned the peppers because the flame was too hot. Using the oven, at least, you can monitor the peppers easier and pull them out before the burn completely (something which is hard to see on a guajillo which has a dark skin). When in doubt, blister them for four, five minutes at a max and then take them out. Better to be underblistered than overblistered. And one of the best things about the recipe? 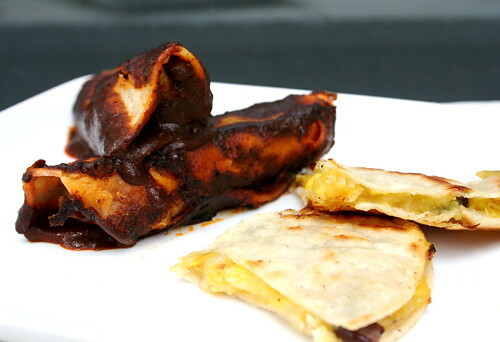 You can take any leftover tortillas, plantain mash, beans, and corn and make quesadillas! Who needs cheese when you’ve got plantains and homemade chili gravy? Peel and cut the plantains into equal size chunks. When the water is boiling, add the plantains to the water and cook for 12-15 minutes, until the plantains are soft. Drain the water, rinse the plantains, and put in a medium bowl and mash. Set aside. Heat the oil in a skillet over medium-high heat. Stir in the flours and continue stirring for 3 to 4 minutes, or until it makes a light brown roux. Add vegetable broth or water, mixing and stirring until the sauce thickens. Turn heat to low and let sauce simmer for 15 minutes. Add water to adjust the thickness. Pour the 1/2 an inch of oil in a small skillet, and heat the tortillas one at a time, flipping over to warm each side. Add more oil as needed. Keep them wrapped in a cloth until all 8 are heated. Pour 1/2 cup of chili gravy in an 8×8 glass baking pan. Take a tortilla, put 2 large spoonfuls of plantain mash in the tortilla. Add 1 spoonful of black beans and corn on top. Roll the tortilla and place, seam side down, in the baking dish. Repeat with the remaining tortillas. Pour remaining chili gravy on top of the enchiladas and bake for 10 minutes until bubbly. That. Looks. Awesome. I will have to try them out with corn-free tortillas! Aw man, wish I could find plantain in Melbourne. I love enchiladas and I always make them with black beans. Yours look incredibly delicious, I love that rich, beautiful color. Great recipe! I’ve never tried plantain mash, Jes, but now you’ve inspired me. And you make your own chili powder? You are too much! That meal looks delicious. That looks delicious. And I’d never have thought to use plantains in enchiladas. I realized how awesome plantains are while testing for Terry. This recipe sounds spectacular! Ohh, I’ve never cooked with plantains myself, and I’m realizing that perhaps that’s why I haven’t liked them… This looks amazing, at least! What an inspirational set of flavors, so different than what I usually work with! Making your own chili powder is so badass! The enchiladas look amazing, and I’m glad you got rid of that little nagging desire to make them. Speaking of plantains and enchiladas, I *just* ordered Viva Vegan a few minutes ago. It looks awesome, I can’t wait to try some recipes. I made this last night and it turned out perfect. It was so great. I wrote a post about it at http://lvkitchen.blogspot.com/ if you want to check it out.